Of course our school teachers taught us the history behind Guy Fawkes Night – how he was captured in an attempt to blow up the Houses of Parliament and executed – but as children, November 5th meant only one thing. Bonfire night – with fireworks on the side! Oh, the excitement when Dad came home brandishing a brand new blue box of Brock’s Fireworks. I can see it all in my mind’s eye; my breath puffing in front of me like dragon’s breath in the dark frosty night, the damp air heavy with the scent of rotting leaves and chimney smoke. Dad places the rockets in empty milk bottles and pins Catherine wheels to the trunk of the lilac tree before setting them off in a burst of colour. And don’t forget the sparklers! Oh no, don’t forget that explosion of golden stars in your hands. 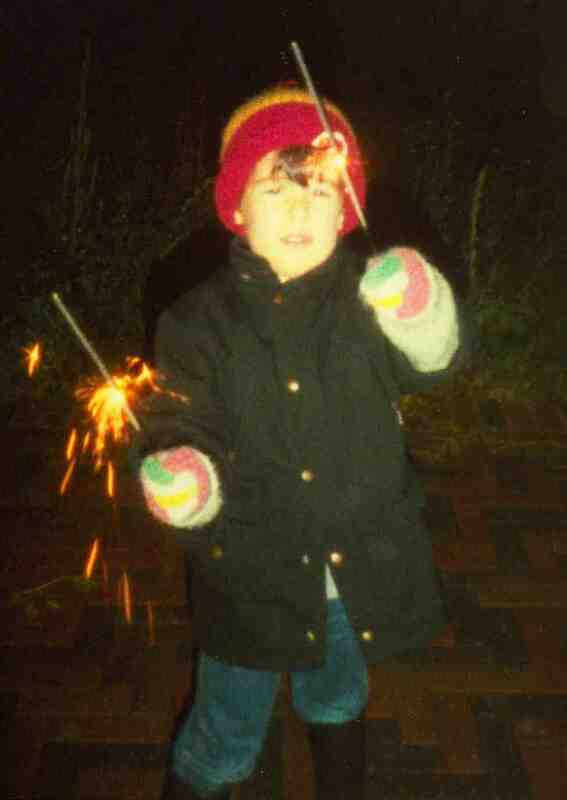 But one of the most magical Guy Fawkes nights I remember was exactly ten years ago on the Isle of Arran. Standing on the beach, with the bonfire roaring behind us, we looked across the 20 mile stretch of black water to the Ayrshire coastline as tiny prickles of colour – blue and red and silver and green and gold – sizzled to north and south as far as the eye could see. This entry was posted in Uncategorized and tagged Bonfire Night, Guys Fawkes, Isle of Arran. Bookmark the permalink. This is fascinating! I had never heard of it before, but it certainly sounds like a fun family tradition. Who is that in the picture???? It was a lot of fun and it’s one of the few things I miss about the UK. When we moved here at first we tried to replicate it with just sparklers, but it wasn’t the same. As for the boy in picture… Hmmmm. Could it be your son-in-law? I think it might! I thought so!!!!! He really hasn’t changed much, has he? Still as cute as ever!!!! It was a great night, wasn’t it? I used to love it. Yay Guy Fawks! Think we could bring him back and let him see our parliament. Fireworks were always fun but now people take no care or consideration and have ruined it for all. I remember hearing that they used to celebrate Guy Fawkes Night in Newfoundland, Brigid. Don’t know if that was true or if they still carry on the tradition.